You may get a bit of a push from your marketing as it stands, but without that first brick, without developing a solid underpinning, there will be little strength or support for anything that comes after. To ensure you have the most stable of bases for your platform and marketing framework, there are two things that you must do. 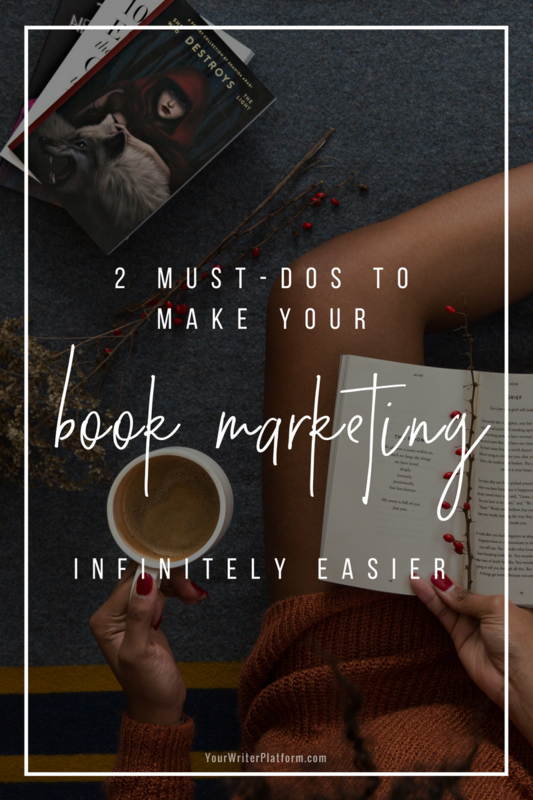 And if done thoroughly, completing these two tasks will not only have a marked effect on your book marketing results, but will make the marketing process itself, much less painful. Before you do anything to promote yourself or your work, you MUST be able to articulate plainly, succinctly, and without hesitation: why you write what you write, and who cares that you write it. People will give you very little time to make an impression. Whether it’s via your website, on social media, while scrolling and clicking on Amazon, or even browsing in a bookstore, you have but a moment to grab their attention. Even with the most irresistible book cover, the most articulate sales copy or the most fascinating website, the odds are statistically small that you’ll be noticed in today’s caterwauling of ‘buy my book’. Imagine how much more difficult it is to capture attention and convince a reader to purchase, when even you can’t provide a reason why they should. In Simon Sinek’s book Start with Why: How Great Leaders Inspire Everyone to Take Action , he discusses the concept of The Golden Circle–a framework that outlines a pattern or relationship between the what, how and why of an organization and how these concepts play into the level of connection, loyalty and influence a business has with its customers. He uses this model to demonstrate how great leaders inspire action because of their ability to share their ‘reason for being’. According to Simon, it’s easy to explain ‘what’ you do, a little trickier to explain ‘how’ you do it, and rare if you can clearly express ‘why’ you do what you do. Those that can explain their why, enjoy a much higher level of engagement from the people they wish to lead or the customers they choose to serve. How is this relevant to writers building their platform? Your ‘why’ is what makes you unique, and when clearly defined, allows your readers to emotionally connect with you and your work. And increased emotional connections lead to increased trust and loyalty. What you do: write fiction, non-fiction, novellas, articles, poetry, web copy and so on. How you do it: your difference from your competitors; in marketing speak, it’s your unique selling proposition, or what makes your work distinct from other writers in your field. It is the meaning and message behind your work. The piece to the puzzle that you need to solve, that, once determined, eliminates the need to continually try to differentiate yourself. Glowing testimonials, a list of credentials or 5 star reviews may help woo a reader, but disconnected from your ‘why’ won’t build loyalty and trust. Forming a community–an experience–around a common set of beliefs and values, will. People who believe in your ‘why’ will read your book, subscribe to your email list, comment on and share your posts, support your work and be inspired to spread the word. But here’s the hitch: you can’t invent or copy your ‘why’. It must be authentic for it to resonate with people, and that quality alone makes it unique to you. Copying other writers doesn’t work. But studying other successful authors does. You can research how other popular writers are making a connection with their readers, then tweak and apply what jives with your personal message. Once you are über clear as to your reason for why you do what you do, then it is much easier to share that vision with your potential readers and weave it through the rest of your marketing strategies. Your work is the embodiment of not only what you care about, but also what your readers care about. Everything that you share with your audience going forward must stem from this core concept. Now that you’ve identified and can express why you are creating the work that you are, it’s much easier to identify the the group of people that will be most receptive to your message. Consider this scenario: You’ve just published your new sci-fi unicorn mystery thriller (with a touch of romance) “Mint Julep”, and want to shout it from the roof tops. You settle for blasting its release ad nauseam on every social media platform that will have you. And even though you know that every author says this, truly, this book is for EVERYONE!! Even one of the bestselling books of all time–the Bible–isn’t for everyone, so before you try to market your magnum opus to the world, take the time to determine who specifically will receive the most benefit from your work. Besides, how can you possibly know if your book is right for someone, if you know nothing about them? How does it further your goals–or the potential reader’s–for you to push a book on them that they may have no interest in, receive no benefit from, or worse, that they may have some issue with? How will it serve you (or your audience) to have your book read, and likely reviewed or critiqued, by the ‘wrong’ audience? And of course, the big question for writers: how do you develop a marketing and book promotion plan when you have no idea who you are trying to reach? Don’t give yourself a migraine trying to promote to anyone with a pulse. Even the most skilled marketers narrow the field to give themselves a fighting chance. Instead, flirt with the advice of Jeff Bezos, founder and CEO of Amazon.com, and become obsessed with your readers. What other authors and genres do they read and enjoy? How are they connecting with their favourites online? What questions are they asking on other sites? What questions are they asking on your site? What kind of conversations do they have and what ‘language’ do they use? Is there a lingo or insider catch phrases that only those ‘in the know’ will understand? Who do they consider as resources for their next read, inside information, hot new releases or genre specific ‘news? Where and how do they purchase what the read? And in what format? Whom does your work help? Whose problems can you solve? What groups share similar interests and values? How is information shared with others in their group? Who already ‘speaks your language’ or conversely, whom does your work speak to? I have yet to meet a writer who isn’t also an avid reader, so look at your own habits, influencers and experiences. What do you want from your favourite authors? Where do you get your tips for new reads, and where do you tend to congregate when you want to chat with like-minded individuals about the books you read? As you gather more and more information about your audience, be careful to stay connected to your reasons for sharing the work that you do, and focus on only those topics that are relevant to the community you are building. As you get to know your audience, what they want and need from you in the form of content, should become easier and easier to define. As you get to know yourself, it should become easier and easier to provide it. Accomplish these two things, and you’ll have created a solid footing from which to build trust, engagement and a much more effective promotional strategy. Without this base, you’re making your marketing job much more difficult than it needs to be. Have you skipped these vital two steps on your road to building the ultimate writer platform? Do you think clearly defining your ‘why’ and the audience you intend to market to will make things easier or more difficult? Oh, how this resonates with me! I really believe that because I’ve been spending time on these two questions, it’s accounting for a much higher rate of sales than I’ve ever enjoyed before. But more than that, I find myself reaching more readers and offering them something of more value than I was ever able to before. I have no doubt as I continue to pursue answers to these two questions that more and more good response will pour in. THANK YOU for this article – it’s one I’ll be sharing a LOT! Fantastic, Susan! I think sometimes we miss the forest for the trees, and overlook the obvious: what do we have to offer, and who’s interested? I’m glad you are seeing such great results from focusing on these two tasks. And you make an excellent point: the value you are able to offer your readers correlates with the amount of effort you put into clarifying these two things. This is by far the best most thorough and most succinct article I’ve read on targeting your audience. It breaks it down. It says who and what and why. You’re helping a lot of authors by having written it. Thank you for your compliment, and I’m so glad to hear that you found the article helpful. Simon Sinek’s book was an eye-opener for me, as it really shines a light on how important our purpose is to creating meaning for – and a connection with – our readers. you got me over a big hump. your article resonated with me because i was trying to figure out what to write about on my blog. now i am focused and can begin. thank you…. Isn’t it just sooo much easier, Stephany? From blog posts to social media, the problem of ‘what should I write about?’ disappears. Good luck! Let me know how it goes, and so glad I could point you in the right direction! Regarding your questions, I do think knowing your audience is key, but I also struggle with the idea that you should only market within a niche. I would love to know blow-by-blow the history of when/how Harry Potter became a ‘kids book that adults read’. This just strikes me as a great example of a book that outgrew its target market. So, yes, absolutely i need to know my target market, but as you say, the reason for writing is perhaps the compelling thing, because that perhaps transcends any particular audience. Thanks for sharing your thoughts, Mike! I’m glad you see a connection now between the ‘why’ and the ‘who’, and how clarity and interconnectivity on those two things will take your marketing to another level. As for your other point, for me, the size or narrowness of your audience is not as important as how well you understand their needs. Whether you’re targeting hundreds of potential fans in a small niche – or thousands of potential readers – how intimately you understand their interests and desires, is the key. A benefit with niche marketing, is that it tends to be easier to get to know a smaller, more cohesive group. The larger and more diverse the group, the more complicated your marketing strategy tends to be. The Harry Potter phenomenon, and others like it, are great examples of how multiple markets can be tapped into, as long as the needs for all the different groups are being met in some way. Would you agree, Mike? Yeah, I think you’re absolutely right. Where the challenge lies, I suppose, is in recognising what those needs are, and meeting them effectively. I think, the larger the market, or the more multiple markets you target, the more generalised the marketing must become, in order to meet the varying needs. This then returns to the question of why you write. If you write because you’re desperate for the world to know every thing these is about small aquatic plants, wide marketing will be difficult. If, however, your dream is to help people escape their every-day, humdrum existence and escape into a wonderful fantasy world, it’s probably somewhat easier! btw, sorry about spelling your name wrong in my last comment! Stick to the things you have the most control over – knowing yourself, knowing your audience – and let the rest work itself into place. Sometimes you just can’t anticipate the effect your work will have on a particular group (going back to Harry Potter), but if you’ve established a solid foundation, you’ll be much better prepared to take advantage of any opportunity that presents itself. A key point you made Kimberley is that you can’t always anticipate. J.K.Rowling may have had no idea adults would love to read the book as much as they do. I would bet that she picked her main audience to target, kids of a certain age/interest and reading ability to do her initial marketing. What happened was she reached those readers quite successfully and the popularity began to spin off to the other groups, the adult parents and then to other adults. It would have been very difficult to market to all of those groups out of the gate and I don’t know that she ever really did market to adults so much. I would say most things are aimed at the kids and the bonus is the adults. Focusing on a core audience, especially at first, does not at all mean that other groups won’t hear the message or would never buy because the marketing isn’t specifically aimed at them. Starting simply and growing is much less confusing and overwhelming for all involved. I completely agree. Capitalizing on additional opportunities as they present themselves is a fantastic idea, but focusing on – and marketing to – an ‘ideal fit’ group of people to start with is generally the simplest and most effective path. Thanks for taking the time to share your insights, Cheryl! This I need to print out, study, and take step by step. I can tell these points are worth my time. Thanks so much. I have been struggling trying to create a business plan or at least a process that will be the foundation for organizing and expanding my reach as a playwright and soon-to-be author. I had jumped right in working on my marketing plan when I saw this post!! Thank you for asking me to ask myself the right questions! I have no trouble explaining what I do or how I do it but stumble on the ‘why’! I get many emails, Jeanette, where authors are doing exactly that: jumping right in! Which is fantastic because they’re taking action, but it’s just a bit too helter-skelter. A little extra time figuring out the purpose behind the actions can really make your business plan come together. Plus it will help you stay on track over time as you build your writing career. Thank you for helping us who are not “there” yet in our publishing. I am going on a trip soon and I plan to spend some time alone thinking about laying my two cornerstone bricks on my publishing. What an excellent opportunity, Jean! I find it works best to start the brainstorming and deep soul searching on your own, but once you think you’ve got the bulk of the work done, consider asking for some outside input. You’d be surprised at what others see in you that you don’t see yourself. Very interesting stuff here. I don’t think a whole lot of us consider these questions, whether we’re writers or not! It seems obvious seeing it like this, but of course we need to get this figured out before we can possibly connect with readers! Need to get to work right away. I see Simon has an online course to push you through the process. Might just sign up and get this done. (I have a to-do list that goes ’round the block.) Thanks again for another mindful and inspiring article. It is fascinating how we tend to skip over this part of the marketing process, but to be fair, nailing this stuff down is actually the hardest part of your whole marketing and platform building experience. After a short while, you’ll be able to do most of the marketing tactics and techniques in your sleep, but digging deep to find the real reasons you do what you do – that is no small task. Definitely check out some of his free YouTube videos (I’ve linked to one in the post), and have a quick read through the book (I’ve borrowed my copy from the local library). If you do take the course, I’d love for you to shoot me an email, and let me know if you find it beneficial. This is really timely. Today I started the ‘detail’ work on my business process and marketing plan. I was having problems and this cleared a few things up for me. I am a playwright and (yet) a novelist but the foundation for planning is the same. Thank you again! Keep me up to date on how things are going, and best of luck on your launch! I’m not sure how the “why” thing works for writers. I mean, writers write because they must, I guess. Don’t they (we)? What other answers are there for this “why do you write” question? What am I missing here? I’d love to hear other writers’ answers. Thanks for asking this, Joab. I’m sure others are thinking the same thing, and it will be interesting to see how others respond. My response is this: you have to dig deeper than ‘I write because I have to’. What compels you to write? Is it the process of creation that drives you, or the need to share your view of the world? Do you wish to move people? Educate? Entertain? Why do you choose words as your medium of self-expression? Do you hope to make an impact on the world, or is writing a deeply personal act to clarify your own thoughts? What is the purpose behind your writing? Remember, your motivation or purpose may be larger than your writing. That is, writing may be just one form of expression of your ‘why’. Look at other things you do (or wish to do) in your life: volunteer or philanthropic endeavours, groups or organizations you belong to, strong beliefs or values you live by, causes you support, religious affiliations and so on. What is really driving you to do the things you do? Dear Kimberley, Indeed WHY is the foundation of everything – which I have used as a sine-qua-non of my engineering design and manufacture for over 40 years – there is no other question worth asking as EVERYTHING falls out of its answer. As an engineer I recognise also, because most people operate on knee-jerk and emotion, it is the question least often asked so building on sand results. Indeed, why the hell go to the enormous trouble we all do without knowing WHY but further as you need an answer compelling enough to keep you going . My WHY, which has powered nearly 2 million words is ‘I have somethings extremely powerful to say which I want all the world to hear’. As an Engineer I am building a lovely new world with http://www.thegoldenpath.co.uk so, like all creators, I want everyone to share the joy – it is a passion, a mission to show people how they can climb out of the ghastly stew The Western Ethic has made of Humanity – which is the finest Romance of all – which indeed it is in both senses as ‘The Impossible Made Good’ as well as Mills & Boon. All my Short Stories and verse live in a similar vein all driven by what my reviewer called ‘extraordinarily beautiful prose’ for whose execution I wrote ‘Editing & The Craft of Words’ to help the people on Fanstory.com I review to improve theirs. My final is this, if you write rubbish you will not live while to try to sell badly constructed lumpy language is a cheat – there is a hell of a lot of it about! The Craft of Words to create beautiful material people like reading for HOW it reads is a sine-qua-non of any sort of immortality – even the first sale because one’s text is by far the best advertisement. Yours Margaret Montrose. Dear Kimberley, ‘Editing.. was written as a defence against the echelons of people who claim you MUST have an editor. As an engineer I developed a system for editing which ensures, at the least, readable prose (silk purses can’t.. etc) while ‘How I Write Romance’ deals with the business of proper story (the biggest WHY of all) as so much on Fanstory really is dreadful. If people would like them I am happy to pass them on if we can make a vehicle to do so simply – people drop me a line on margaret@thegoldenpath.co.uk? – I have them in PDF. Very definitely NOT The Plot Whisperer whose genus gives me the creeps as so much is formula today. Margaret Montrose. This is great advice indeed, jam-packed with useful insights! Thank you for this post! My pleasure, Stavros! Glad you found this helpful! I write good, quality fiction involving less than perfect gay men. Why? Because I find there’s not enough stories out there with real gay characters making true-to-life decisions. What you do: I write good, quality fiction involving less than perfect gay men. Why you do it: Still a mystery! 🙂 Why is this important to you? Why do you feel it’s a message that should be shared? And is this the only topic you write about, or is there a bigger picture? Is it important to you that gay men (or gay people in general) are ‘experienced’ in a certain way, for example? A little harder than it looks, hey Rick? 😉 A little more soul-searching and you’ll get it! The article was fabulous, and is copied to my desktop for further study. But this answer above was also awesome, you made it absolutely clear exactly what you meant! That will also be most valuable. Thanks so much! Glad you got something from the post, Varina! And it’s great when we get some good discussions going in the comments section here – a conversation can help clarify things that may have been confusing (or missed) in the article. It never ceases to amaze me how the same messages come to me from different sources right when I need them. The idea of identifying my value to my readers has been awesome. I’ve looked for patterns in my book reviews and discovered from readers comments the value I have. Your post is so timely to this process it’s mind blowing. That is fantastic, Holly! The universe sorts things out for me as well – I just have to pose a question or consider a possibility, and *boop*, blog posts, emails or even videos/books fall into my lap on the topic or idea I was inquiring about. I think just having a positive attitude and being open to opportunities allows the answers to come. So keep up the good work! You’re definitely doing something right! Hi Kimberley. I’m not sure how I stumbled upon your writer platform page, but I’m very glad that I did! It shares great information and feedback from likeminded people. I will tap in often. My book is done, I have a publisher and I’ve been developing and nurturing my platform for many months. The book will be released in May of 2014. I have clearly defined why I write and who will care about it, but what is puzzling me right now is how do I convey the “why” in my marketing efforts. It’s hard to tell you exactly how to convey your ‘why’ without knowing anything about your book, your purpose, your marketing plan or you. What tends to happen, though, is that when you have a firm grasp on the reasons and motivation for why you do something, it starts to ooze out. You can’t help but share it. People might refer to it as passion, charisma or ‘je ne sais quoi’, but they will feel it in your work or whenever they connect with you. Once you have your ‘why’, then you can tweak your ‘how’ to help you share (in practical terms) your message, your vision or you point of view. Well done, Kim! Tons of useful information here. I love Simon Sinek’s book and your snippets here about answering the ‘why’ of what we do are super helpful. Thanks so much, Bobbi! I appreciate your feedback and support, and isn’t Simon’s book simple but powerful? I write contemporary romance to ignite the imagination of women of all ages, entice them to realize their own potential and feel the rapture and power of true love. I write children’s books to ignite their imagination and entice them to reach their potential as new explorers in the world around them. Excellent, Kimberly – as per usual. You are too kind, Gary! Thanks for helping us rememeber and focus on what really counts. I’ve disconnected from some “writer helps” because they showed all that mattered to them was money. Money is way down the list for me and my plans are to sink it right back into what I’m passionate about. That’s what makes this exercise so interesting! We’re all writers, but our reasons and motivations vary considerably. And that’s also why it’s hard to give a one-size-fits-all marketing plan; there are just too many variables for any one thing to work well for every writer. Hi Kim, this was a really great writeup! I am going to use this for my About page which desperately needs to be re-written. Thank you! What an excellent article. Ironically, I’ve got the Golden Circle down pat, but my problem is I don’t put myself out there. I hate selling, marketing, the whole bit. So I know I miss a lot of opportunities and I know I’ve got to get over this. I have something I know people need and want, based on feedback I’ve already received. But I hide! Cynthia, this is a common problem for many people, not just writers – and not just you! Stepping outside your comfort zone can be panic-inducing, but it often tends to be the most rewarding part of a new experience. Try looking at things from a different perspective. Don’t label your efforts as ‘marketing’ or ‘selling’. If you have something that people need and want, how can you refuse to make it available to them? If you have something that can make a marked difference in your readers lives (educate, entertain, etc. ), isn’t it your responsibility to let them know about it? Shouldn’t they at least be given the option to experience your work? Marketing isn’t synonymous with coercion and selling doesn’t have to require force. If you can provide something that people truly want or need, it’s your job to help get it into their hands – and they’ll thank you for it. Just a small tweak in mindset, and you’re on your way, Cynthia! GREAT article. Thank you! I have a very specific demographic in mind when I write now, and it helps me a lot. In fact, there’s a certain reader that has written to me a few times, and I think of HER when I write, because she kinda encompasses my target audience. It really helps when I’m struggling with how to word something to imagine explaining it to HER! I imagine making her cry, making her laugh, making her feel better after reading a difficult part of the book. Putting a face on my audience has, I believe, made my writing a lot more personal, and narrowing my demographic, in my mind, has actually INCREASED my sales because I am pitching hard to the right people. Rose, that’s fantastic! I agree that having an image of the people (or person) that you are writing for makes it much easier to focus your writing. I think it’s important for writers to understand that writing for an audience that you know and understand intimately, is not the same as altering your writing to ‘fit’ a select group for the purpose of selling more books. You don’t have to change the fundamental purpose or message behind your writing to meet your audience’s needs. You just need to find the people that your work already resonates with, and deepen the connection. Thanks for sharing such great insights and your personal experience! This was such a helpful post. I have always known why I write – to fall in love over and over again – but I never imagined sharing that with my readers. Thank you for the advice. A whole lot of baloney. KDP does not help with effective marketing. Sales may come with a deal with a major publisher. POD including KDP is nothing more than digital vanity press. Not sure that I mention KDP in the post, but thanks for your input, J.G. Thank you for this post. I have been contemplating what I have been doing wrong with my marketing. I most certainly don’t have a solid foundation. Many first time authors don’t have a solid foundation, Stefan, but you’d be surprised at how much easier things get once you have clarity on these “must-dos”. Guessing and assuming rarely works, and trying a shotgun approach to hit the widest market possible is often a fail as well. Guess it’s time to get to work on on laying that solid foundation! 😉 Good luck! This is a wonderful article! I just came upon it and the timing is perfect, as I am about to start on my journey as a romance novelist. With a manuscript in hand, I am trying to figure out exactly how to market and promote my work and this article is a fantastic springboard! Thank you! Thanks for all of this great information! It made so many things clear and easy to understand about our motives and purpose as authors and how we connect with our readers.